Among her many forms of activism, Susan B. Anthony (1820-1906) was the proprietor and business manager of the early feminist newspaper The Revolution. From the very beginning, The Revolution had a known policy that “no quack or immoral advertisements [for patent medicines] will be admitted,” though these ads were a large source of revenue for periodicals of the time. The Revolution‘s policy undermines the contention of some advocates of abortion that the early feminists’ opposition to abortion was because it was a dangerous procedure performed late in pregnancy. In fact, the patent medicines that The Revolution refused to advertise were often abortifacients designed to induce early miscarriage. 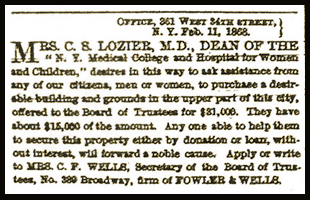 The Revolution published advertisements from women physicians like Dr. Clemence Lozier, fellow women’s rights activist and mother-in-law of Dr. Charlotte Lozier, but refused ads from abortion providers. Thoreau, one of the profoundest of the Concord philosophers, used to say the most instructive part of a newspaper is its advertisements…. Was it Goethe who said that to understand an author, you must read between the lines of his book? …Nothing should be read between the lines more carefully than newspapers. Nothing they contain reveals so much to those who have eyes to see, as their advertisements. Through these, the press and its patrons advertise themselves to an extent they do not know…. Quack advertisements may lie never so fearfully about the stuffs offered for sale; but they speak truly of those who make and sell them, and not less truly of their accomplices of the press that for gain and greed, will advertise and puff their foul preparations. When conductors of public journals are so poor in pocket and principle as to lend themselves to so foul a work, they should be read always between their lines. They and their advertising patrons in such business should be read out of their occupation by a wholesome regard for the moral and material health of the community…. Sword, pestilence and famine combined, are to be preferred to such a presence…. Quack Medicine venders, however rich, proud, and pretentious, Foeticides and Infanticides, should be classed together and regarded with shuddering horror by the whole human race. And yet in every large city they hold more control over the public health and public morals, than all the regular medical schools and the pulpit combined. And by arts the most wily and diabolical, they continue through the newspaper press to beguile the wise and prudent, the high as well as the low, the rich, the poor, the religious, the reprobate, and levy upon them all the most fearful contributions…. Thoreau and Goethe were right. Let us learn to read authors between their lines, and to judge of newspapers largely by their advertisements. Thus we shall get an autobiography of all the authors, and learn the true quality and character of our newspaper press. 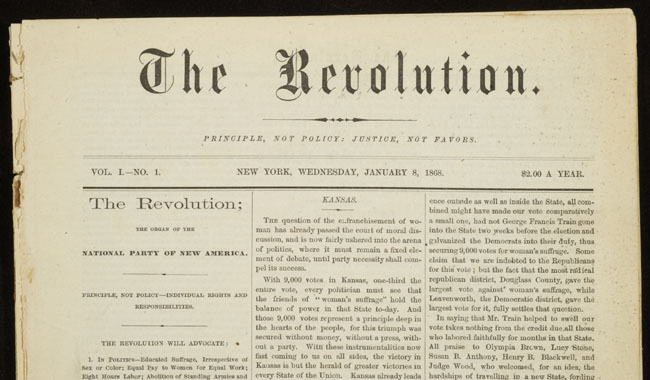 The Revolution‘s ad policy could only be implemented with Susan B. Anthony’s approval. Her responsibilities included selling ads, and the policy remained in place despite the newspaper’s financial problems. When the newspaper went bankrupt in 1870, Anthony assumed responsibility for the $10,000 debt, which she paid off through “terrible struggle” over a period of seven years. To read more of “The Truth About Susan B. Anthony: Did One of America’s First Feminists Oppose Abortion?” the feature story in the Spring 2007 issue of The American Feminist, please visit http://www.feministsforlife.org/SBA/SBA-p1.pdf for more information.